VR doesn't stand alone as the only technology designed to create an alternative, but somewhat lifelike reality. By definition, Virtual Reality (VR) is the most immersive of the "reality" technologies, and usually involves wearing a headset that creates a 360-degree simulation -- virtually placing the user into a digital environment or immersive experience designed to make it feel like he or she is actually there. A few steps back from VR is augmented reality (AR), which essentially overlays a person's real-life, physical environment with some sort of digital imagery that's typically generated by a mobile device. 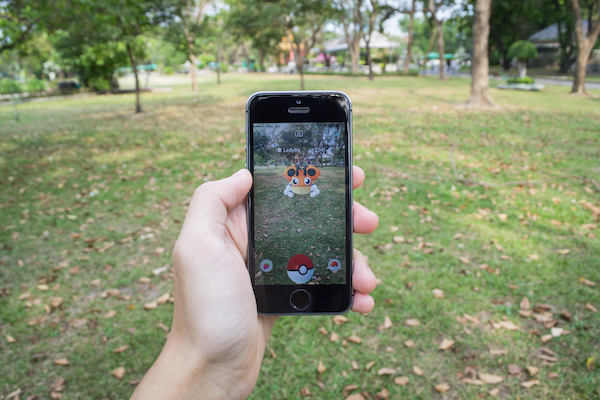 One of the more notable examples of AR is the mobile app/game Pokémon GO, which uses the players' GPS locations to help them "find" and "catch" digital creatures. Mixed Reality (MR) can be thought of as "AR+". It places digital creatures (or objects) in the same way an AR experience might, only with the ability of those objects to engage with the real, physical world around them -- and vice-versa. This one-minute explainer from Microsoft helps to put MR into context. Finally, there's extended reality (XR), which is arguably the most emergent of the four technologies listed here. In essence, XR looks to combine VR, AR, and MR -- in that it creates an immersive, virtual experience for the user, while also allowing that person to continue to see and interact with the physically world around her. 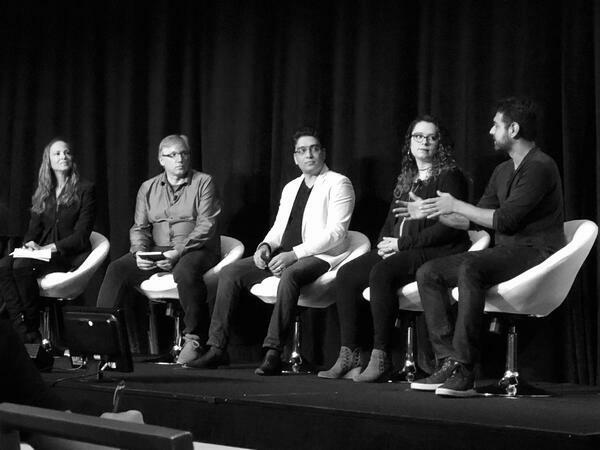 AR as a "Gateway Drug"
That was a descriptor assigned to AR technology by EndeavorVR Founder and CEO Amy Peck during a VRX panel discussion on the ubiquity of digital reality technology. It's a nod to the idea that, while not a fully immersive experience, AR can give users a preview into the world of VR and beyond, in part because it leverages technology and devices that many of us already use on a daily basis -- like our smartphones. 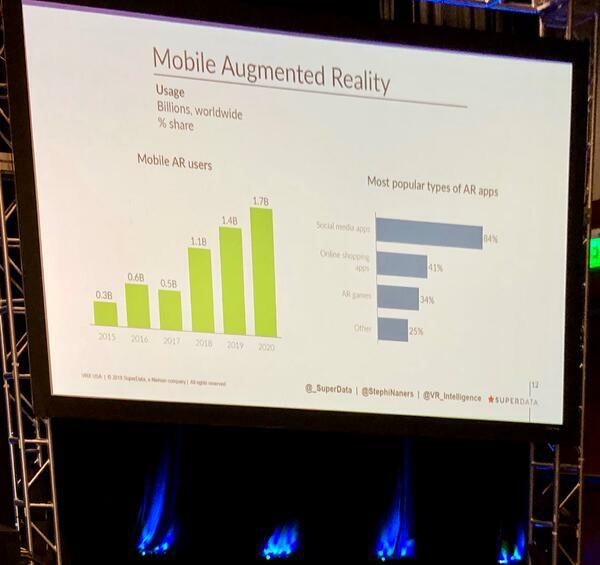 “It’s a little overly-simplistic to think that just because someone uses mobile AR, they’re going to be a VR consumer," said panelist Stephanie Llamas, VP of Strategy and Head of XR SuperData. "Mobile AR is taking something the user already knows and introducing a new use case that then will help them become more comfortable with virtual reality." And while it might take time for that introduction to manifest in the form of VR becoming a mainstream technology -- more on that later -- the journey of AR to VR and beyond reflects much of what has happened throughout the course of technology's history. “It took a long time for smartphones to get into the mainstream. It will happen over a long period of time," said Pearly Chen, Chief of Staff to CEO & Director of Vive X, HTC, during an earlier panel discussion. "A handheld device [that can be used for mobile AR] will naturally evolve into a head-worn device. A million problems need to be solved for us to get there, and that’s why it’s so exciting for us." 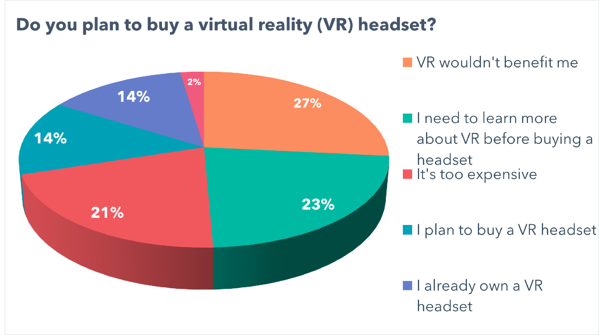 Earlier this year, I wanted to measure the public sentiment around VR -- to find out when, if, and how many people planned to buy VR headsets. And where the answer was "no," I wanted to know: Why not? 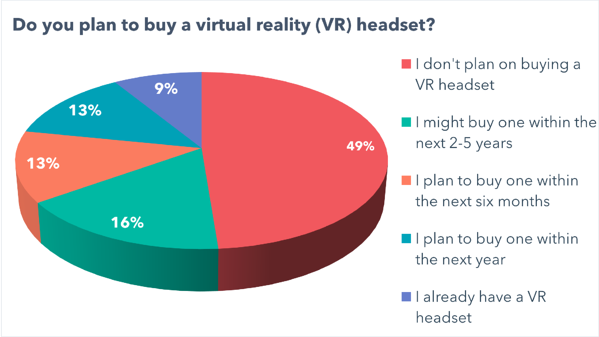 First, after surveying over 700 people across the U.S., UK, and Canada, we found that nearly half of people have no plans to buy a VR headset. Then, for those who indicated that they don't plan to buy a VR headset, we asked what was stopping them. We discovered three key barriers to entry. First, many consumers don't understand the benefits or use cases for VR: a theme that reverberated throughout day one of VRX, and bleeds into the second-highest barrier we found, which is the need for more information about the technology before investing in it. The responsibility in situations like these, said Llamas, is largely on the creators and companies behind the technology, to help navigate users through the VR experience. "We’re going to help you understand the tech," Llamas explained, "and help people navigate VR in a way that provides an entry point." That importance placed on user guidance points to the third major barrier to entry -- the cost of VR hardware for the consumer -- and another key responsibility of the businesses that are creating VR experiences. When we hear the term "location-based," many of us think of GPS technology. But when it comes to the future of VR's ubiquity, "location-based" actually refers to the concept of bringing a VR experience to users where they already are -- for example, at an event or a venue -- to introduce them to the technology without requiring a purchase. A location-based approach to introducing VR to users points to a core tenet of experiential marketing: to bring a concept or a brand to people where they already are, instead of fighting for their attention in a sea of marketing messages. On the other hand, Llamas explained, "Location-based entertainment has some opportunity. It brings VR to people." Looking ahead to 2019, there's one key piece of Llamas's remarks that I would ask marketers and small-to-midsize businesses to keep in mind with their considerations of VR and AR: "Opportunity." While there are barriers to entry, I wouldn't allow that to be a hindrance to exploring the ways these types of immersive or interactive experiences can be brought to your audiences -- and will also point to Llamas's earlier remarks about the history of emerging technologies. "It’s something that needs to take time. If you look at this in the broader context of media history -- radios weren’t that easy to use at first -- every piece of major media we consume today had its pitfalls," Llamas reminded us, "and they were generally a lot worse than the pitfalls we have with VR." Let's have a look at the most popular use cases for Mobile AR. "AR lets you have a quick, artful interaction with the tech on your phone," says HubSpot Principal Video Editor and Animator, "which opens minds to the possibilities of other immersive technology. Developing content for VR is arguably a bit trickier, but that doesn't mean it can't be done -- especially if you have access to a 360-degree camera and can use it to create immersive video content that's often used for VR experiences. 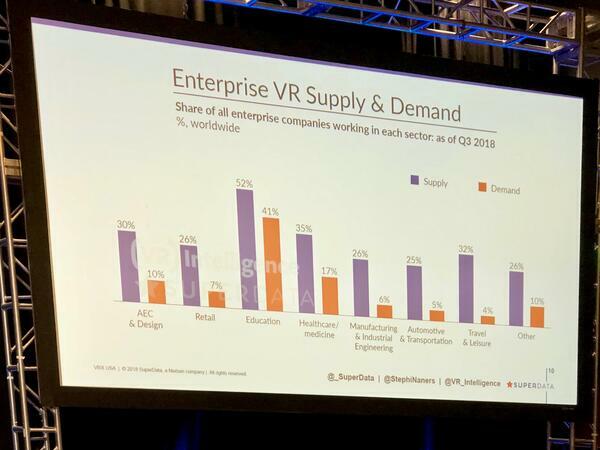 As this slide shows, VR and AR aren't all about gaming and entertainment. Much of the time, it's about partaking in an immersive experience to learn something new -- a message I heard earlier this fall when speaking to attendees of Facebook's annual VR conference, Oculus Connect. "You can cram a lot more information that's 'learning by accident' or 'learning by play' when it's in VR," attendee Steve of DrashVR, which develops educational programs and curricula in VR, told me at the time. "That's the feedback I've heard first-hand: that people can learn more from 10 minutes of VR than in a semester of classes." The bottom line: As 2019 approaches, it could be time for marketers and SMBs to start experimenting with immersive experiences like AR and VR. Whether it's to help people engage with your brand by way of a fun game or animated overlay, or to help them learn something, the general consensus at VRX is that this technology -- while still building -- is in it for the long-haul. "The opportunity is not just to be reaching new audiences," Watkins emphasizes, "but to be pioneering techniques in a new medium."